We are so excited to share you some testimonies that we received during our recently concluded Seven-Day Prayer and Fasting. We hope that you are encouraged as you read through these stories. My dad lost his vision in [his] right eye last year. But last Sunday [January 9], during my dad’s check-up, the doctor said he can already see farther than the last time she saw him: both in his peripheral and his main vision. Last November, na-detect na may sepsis ako. I was confined for two to three days and was back in the hospital [in January]. I decided to pray and believe God for healing. True enough, on the third day of the prayer and fasting, God actually healed me! On the 20th week of my pregnancy, my husband and I discovered that my baby had a cyst. We were expectant for a change and asked people to stand with us in prayer. When I went through our routine scan for the baby last January 10, our doctors confirmed that the cyst in our baby disappeared completely. [I started writing my personal faith goals in the beginning of the year.] On top of my list was for my Mom and my Dad, [who have been separated from each other for seven years]. Last Sunday, January 9, my dad called me to say that he and my mom want to be together again! After seven years we will all be together again as one family! My relationship with my mom has been strained for more than two years . . . After last year’s fasting, I found the strength to start emailing, texting, and calling my mom. I started visiting [her too]. Kitang-kita sa mukha ni Mama yung saya niya kasi magkasama uli kami lahat. I have been working as a salesman for years now and praying for career breakthrough. [Then] I was offered a job as a Sales and Marketing Manager by [a different] company. I was hesitant because I [was working at] a multi-national company that has all the best compensation and benefits that others cant compete with . . . but this small company was able to offer me the best and [much more than what I expected]. I did not have any work or job offers for six months. On the second day of prayer and fasting, somebody called me, offering me with a job with a high salary. I believe God has more in store. God is really faithful! [I believed God for fruitfulness in the area of discipleship.] Nagkaroon [ako] ng Victory Group and nakapagsimula [noong January 13], with three new members. Let’s continue to hold on to the promises of God with strength and courage! 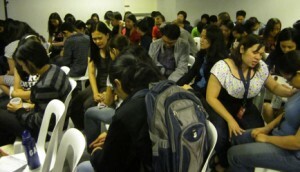 If you have a testimony you’d like to share with us, please email stories@victory.org.ph. We’d love to hear from you! How was the gospel shared to you, and what was so compelling about it?